Chronic Sinus Infections: increasing humidity and using air filters may help minimize the problem. Sunken-Eye Syndrome: Caused by sinus infections. The eye sinks into the socket. Herpes Infections: May cause proliferative lesions, but more commonly exemplify itself by depigmentation (loss of color). Coacal Papillomas: Thought to be a viral condition. Contagious to other birds (thought to be sexually transmitted). 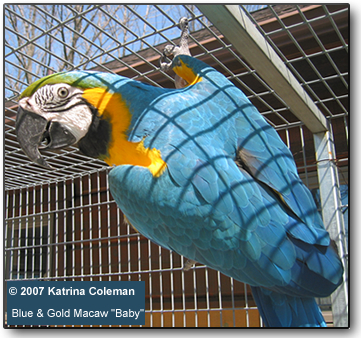 Affected birds should not be used for breeding. Kidney disease (gout) - May be caused by excessive supplementation of Vitamin A.
Annular Toe Lesions: Seen in chicks, may result in loss of toes. If you notice any sign of illness, it is important to provide supportive care until a pet can be taken to a veterinarian for assessment and treatment. Please refer below for recommended tests. 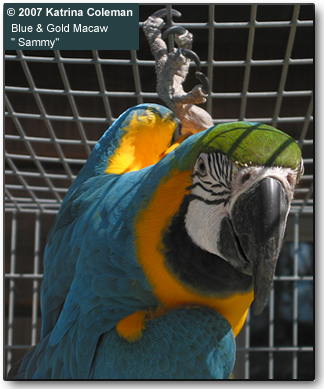 Should your parrot be sick, it is important to provide supportive care until he or she can be taken to the vet for evaluation and treatment.